Although objective survival endpoints are important, they may not fully capture the impact of treatment for bladder cancer. Health-related quality of life (HRQOL) is a subjective, patient-centric outcome that provides a more complete assessment of the impact of a disease or its treatment. HRQOL is a vital component when counseling and treating bladder cancer patients, and is also an important comparative-effectiveness research outcome. 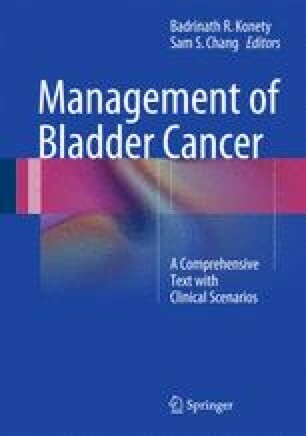 Although there is no gold-standard method for measuring HRQOL in bladder cancer, the use of reliable, valid and responsive disease-specific instruments is mandatory. Studies to date have not consistently demonstrated the superiority of any diversion type after radical cystectomy, however with proper patient selection and preoperative counseling, postoperative HRQOL can be comparable between diversions. With ongoing study of HRQOL in bladder cancer, we will continue to improve cancer survivorship and refine patient treatment. EORTC Quality of Life. Available from: http://groups.eortc.be/qol/. Accessed 21 Apr 2013. Patient-Centered Outcomes Research Institute. Available from: http://www.pcori.org. Accessed 21 Apr 2013. Quality Metric. Available from: http://www.qualitymetric.com/WhatWeDo/SFHealthSurveys/tabid/184/Default.aspx. Accessed 21 Apr 2013. FACT-BL. Available from: http://www.facit.org/FACITOrg/Questionnaires. Accessed 10 Mar 2013. EORTC QLQ-BLM-30. Available from: http://groups.eortc.be/qol/bladder-cancer-eortc-qlq-bls24-eortc-qlq-blm30. Accessed 10 Mar 2013. EORTC QLQ-BLS-24. Available from: http://groups.eortc.be/qol/bladder-cancer-eortc-qlq-bls24-eortc-qlq-blm30. Accessed 10 Mar 2013.